The effects of climate change are notably significant in India given the agrarian nature of the country, its reliance on glacial melt water from the Himalayan plateau for both irrigation and drinking and rising sea levels which threaten mangrove forests along both coasts. Moreover, increased desertification caused by seasonally hotter weather in the northwestern portions of India has reduced the available arable land for a variety of crop and non-crop vegetation. As the Indian government becomes more concerned about food security and access to natural resources they are looking towards external solutions to ameliorate the nations concerns. While the government may serve in a policy making role to address these issues they are also facilitating and fostering private industry efforts to achieve workable solutions. Most recently, Indian companies and the government have focused their attention on Ethiopian land as a future resource of rich farmlands and have already financed a growing number of land deals which could instigate armed conflict and oppression against the indigenous people of Ethiopia while also fueling existing tensions between Ethiopians and their neighbors. Ethiopia is one of the main targets in the international farmland grab which has been infiltrating Africa for the last decade. Richer countries in the Middle East and Asia in particular are searching for alternative farmlands to supplement their existing resources and ameliorate future threats to their own lands caused by climate change and other phenomena. Saudi Arabia, United Arab Emirates, China, South Korea and India lead the way in searching for and obtaining arable land worldwide, and specifically across Africa (Dyer, 2011). While the focus here will be on the relationship between India and Ethiopia, this relationship is a proxy for a much wider international struggle which could redefine the concepts of national sovereignty and territorial integrity. The exact details and terms of these land purchases are difficult to access from public records, however they are individually on the scale of tens of thousands or hundreds of thousands of hectares usually and even millions of hectares in some cases. Collectively they represent tens of millions of hectares of land across the African continent which in theory are now owned by a foreign company, which in many cases is acting in collaboration with a foreign government. Maintaining security over land areas that large may be impractical for a host government, especially those which are notably resource constrained. Existing local or regional tensions coupled with animosity towards foreign influence could create small scale hostile exchanges which cause casualties among the foreign workers who are brought in to administrate these land projects. To what degree will a foreign land owner then have a right to protect their land and investment? Topographic views of Ethiopia and India; two countries engaged in large scale land purchasing programs. 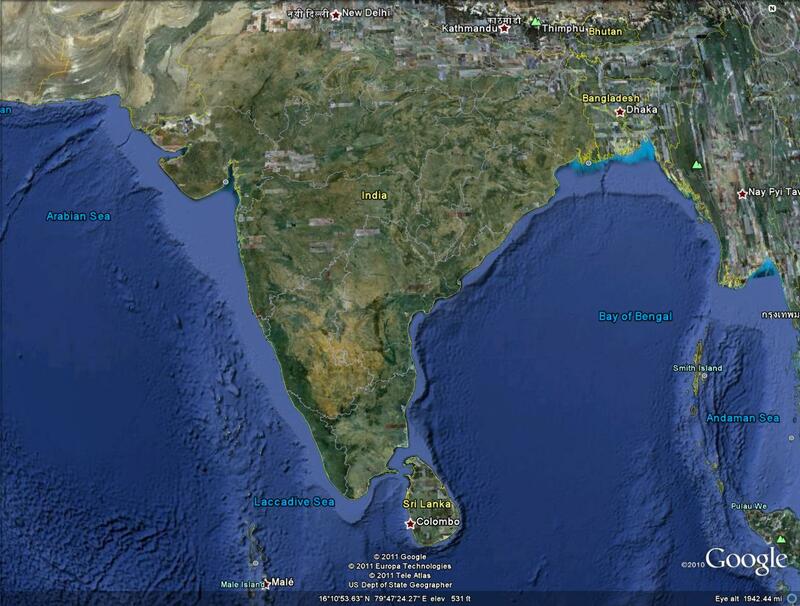 Source: Architects Without Borders/Google Earth. Even as questions of sovereignty and real ownership linger, Ethiopian farmland is being bought or leased on an immense scale. The Ethiopian government has stated publicly that it wants to sell off three million hectares of farmland in the country to foreign investors, and around one million hectares have already been signed away. The country has approved 815 foreign-financed agricultural projects since 2007 and land is being leased for approximately $1 per year for 2.5 acres. The country gave out 600,000 hectares (1.48 million acres) to foreign entities between 2004 and early 2009, according to a report by the United Nations Food and Agriculture Organization (FAO) (Bhatia, 2011). These land deals offer little transparency into their details and are often made between regional power brokers and the foreign investors directly. The national and regional negotiators who benefit from the windfall in sales revenue can then purchase military equipment, supplies and expertise to maintain their control and quell any disagreements from the local populace (Mersha, 2011). hectares of land in the western region of Gambella to grow and process sugar, rice, palm oil and cereals. The government may lease the company a further 200,000 hectares if it develops the land by December 2012 (Davison, 2011). India’s motivation for obtaining arable land in Ethiopia, however, extends beyond the need for food security. Indian energy security interests are also supported by Ethiopian land acquisition in terms of expanded bio-fuel production capability to alleviate dependency on imported fossil fuels and to reduce greenhouse gas emissions. India’s renewable energy company Praj has recently made deals with Ethiopia’s Eco-Energy company to obtain thousands of acres to grow crops, mainly sugar and jatropha, in support of bio-fuel production. Praj will provide consultancy for development of a 25,000 hectare area for a large scale sustainable annual energy crop farming system (Abate, 2011). In general, bio-fuel related projects require extensive land areas since the amount of energy extracted per unit of crop material is generally small requiring extremely large quantities of scale. The Ethiopian government has identified 23.7 million hectares of land for solely supporting the development of bio-fuel. The land which is sold, in many cases, does not come without any prior claims. Much of the land that foreign investors have acquired is in or near the western province of Gambella, a fertile area that is home to the Anuak nation. The Anuak are an indigenous people who have always lived in Gambella and practice farming, pastoralism, and hunting. Resistance to these types of projects is difficult given the past experiences between the Anuak and government forces. On December 13, 2003, under the pretext of retaliating for an attack on a UN vehicle, the Ethiopian army went on a rampage and killed over 400 male Anuaks (Ochalla, 2010). Having failed in convincing the government to alter their strategic plans for leasing their land, the Anuak have called upon the international community and even directly communicated with citizens of some of the these foreign countries directly using the Internet through such sites as the Solidarity Movement for a New Ethiopia (quote below). The plight of the Anuak is similar to other groups living across Ethiopia who may either have their own land confiscated and sold or be forced to accept the presence of refugees displaced due to land sales in neighboring parts of the country. Gambella is also close to traditional friction spots further south near Lake Turkana where the Turkana’s of North Kenya have been fighting with the Merille’s in Ethiopia. Both the Turkana (who number around 100,000) and the Merille (who number around 50,000) are traditionally nomadic. The Turkana have lost a majority of their lands over the past fifty years including portions on both sides of Lake Turkana and the ‘Ilemi Triangle‘ of Sudan (Thurston, 2011). The fighting stems from local conflicts, but also reflects a broader pattern of inter-ethnic conflict resulting from food scarcity and persistent drought. Ethiopia also has a history of friction and conflict with its northern neighbor Eritrea which dates back to the 1950's and finally ended with Eritrea's acceptance into the United Nations in 1993 (TED 002, 1997). 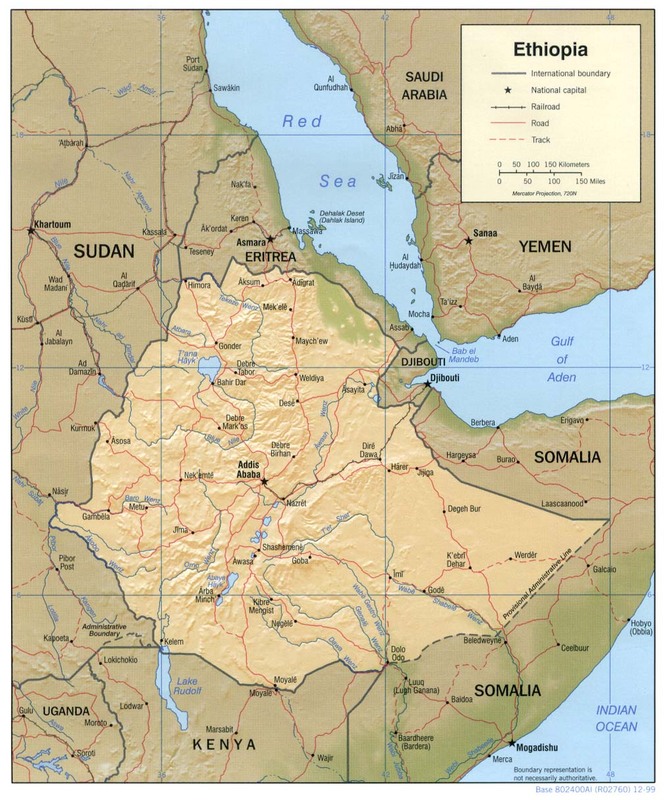 The porous nature of Ethiopia’s borders will help facilitate the spread of internal strife and conflict to neighboring populations thereby further endangering the regional security posture. Ethiopia is currently experiencing a famine which is already the second one in the first decade of this century. In 2005, Ethiopia faced a food crisis, with the total number of victims estimated at several million people. The stage appears to be set for a similar situation when the global community came together in 1985 to collectively assist Ethiopians stricken by one the worst famines in recent history. During that period about one million people died from starvation (Anonymous, Poverty and Environmental Hazards, 2011). While there may be some benefits in providing Ethiopia with advanced technology for cultivating its abundant fertile land, it will be difficult to balance cooperation with exploitation. The availability of land and modicum of grass roots resistance makes these deals almost inevitable, with the main beneficiaries being the foreign buyers and direct sellers (Dyer, 2011). Focusing international effort and concern on this issue will likewise be difficult considering that the egregious participants include some of the most developed countries in the world. This "neo-colonialism" as it is sometimes now called could draw in more participants over time complicating any hope for reconciliation of disputes or implementation of orderly processes. India has seen accelerated effects of climate change in the form of increased glacial melt for the last decade.While this may initially provide some benefits in terms of expanded irrigation, the reducing ice melt will cause loss of farmland in a 30-50 year horizon. The actual purchase of Ethiopian land by foreign entities has notably progressed during the last decade. The affected locations are mainly the western and southern regions of Ethiopia which account for most of the available farmland and also have high numbers of indigenous people. Ethiopia has a varied terrain which includes mountains, desert lands and fertile plains. Aside from the abundance of rich farmland, foreign land buyers are also attracted by an available supply of irrigation water stemming from the various lakes shown in the figures above. Source: Code-Donkey.org. Sovereign Actors: Ethiopia. Ethiopian Government in particular, but also governments of regional neighbors such as Kenya, Eritrea and Somalia. Non-sovereign actors: Indian private companies involved in large-scale mass agriculture (crop and non-crop) and bio-fuel processing. Also, indigenous local populations such as the Turkana of northern Kenya and the Merille of Ethiopia. 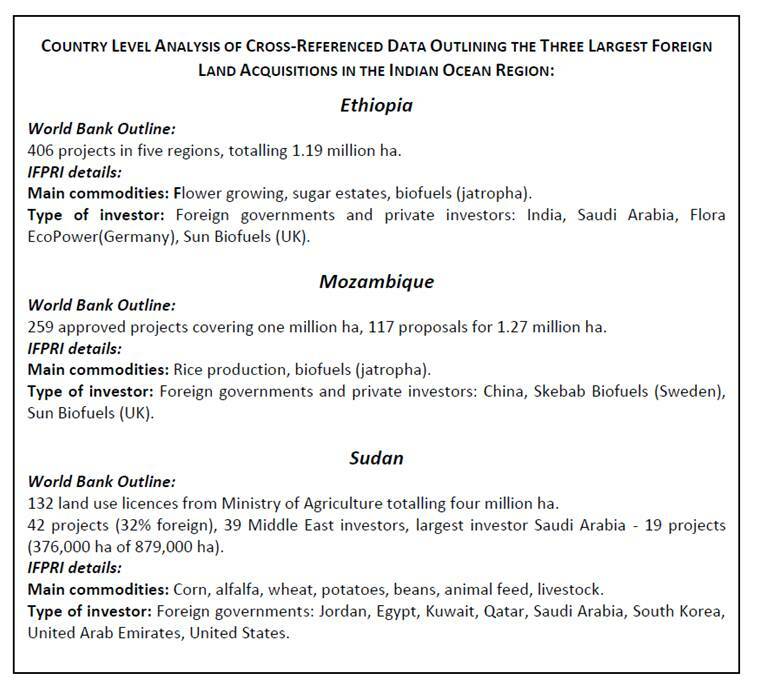 If foreign acquisition of land was confined to Ethiopia alone the issue would be easier to address, however as indicated in the table above there is a widespread acceptance among African governments in allowing these transactions to continue. India has focused its efforts in Ethiopia, but Saudi Arabia and others are established in multiple countries. 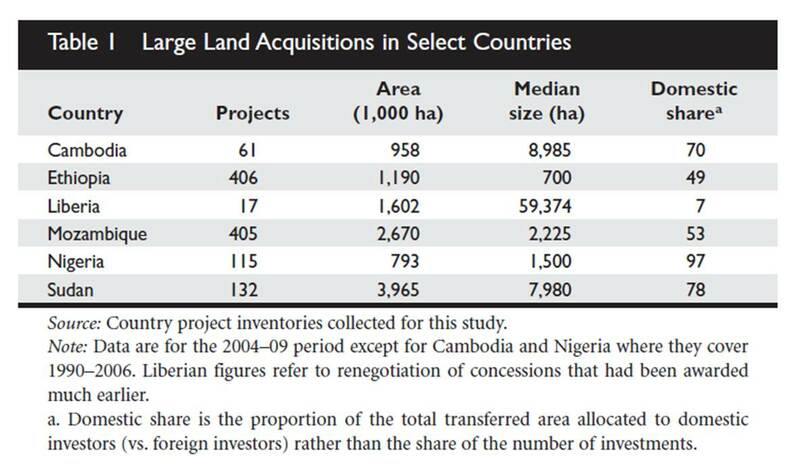 Source: The Complications of Food Security and Global Land Acquisitions, Future Directions International, 2011. The environmental problems from climate change facing both India and Ethiopia will exacerbate the potential for conflict going forward. 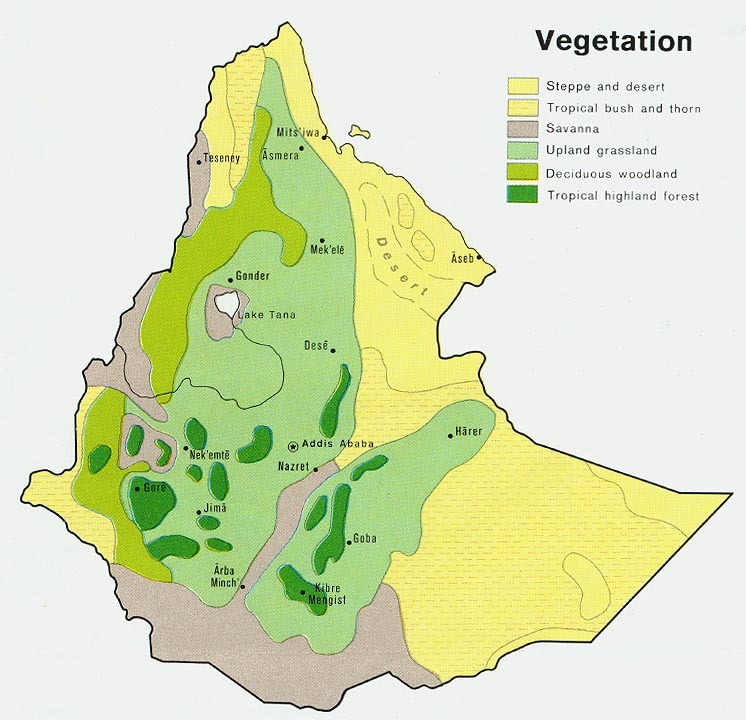 Ethiopia is a land locked country with varying geography and vegetation profiles. Indigenous people live in small groups across the country with only one large city (Addis Ababa). The habitats being considered for land purchase are mainly in the western and southern portions of the country where the farmlands are most fertile. 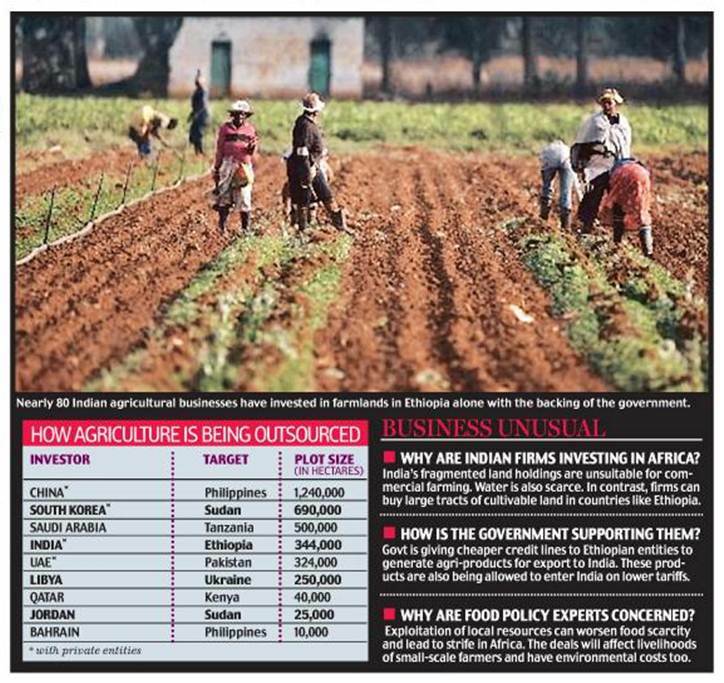 India is only one of the developed countries in the world which is procuring land in Africa to further its own agricultural production and ensure sustained access to vital natural resources, in this case fertile farmland. The worldwide list of Act and Harm players involved in land grabs is actually much more expansive. Civil Unrest and Resource Access. Civil unrest and potential reprisal attacks against foreign workers in Ethiopia is very likely. Armed conflict on small localized scales is very possible as a result of animosity on the part of displaced populations and government efforts to relocate poulations or suppress minorities. Indian worker in Ethiopia's Gambella region. Civilian casualties would far outnumber military casualties in any armed conflict in Ethiopia. Since the Ethiopian military would be better trained and equipped than any civilian groups involved in an uprising a war of attrition would certainly favor government forces. Fatalities from direct armed combat could number into the tens of thousands. Another source of fatalities, but unrelated to armed conflict, is suicide among ruined farmers in India. As lack of irrigation water and hot weather causes crop failure across the country there have been hundreds of thousands of suicides among farm workers during the last decade (Renton, 2011). 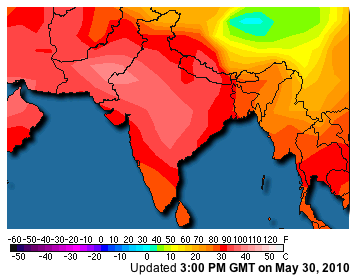 Climate change will cause regional increases in temperature across South Asia which will have compounded effects on India, both directly and indirectly. 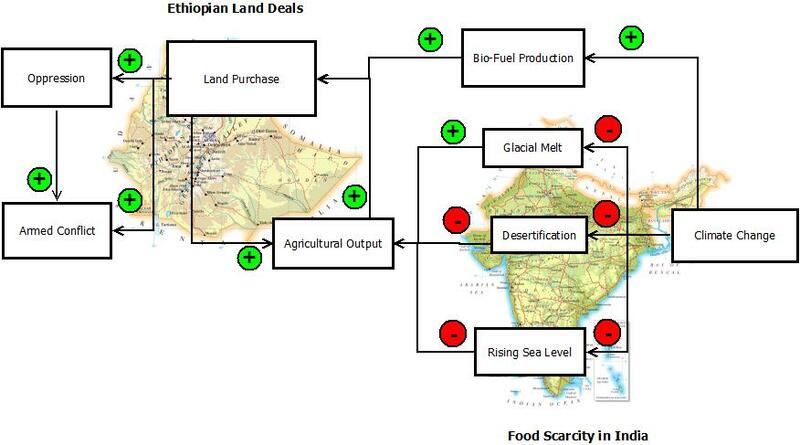 The causal loop diagram above indicates that the direct effects will include increased desertification in the northwest and central areas; rising sea levels along both coasts; and increased glacial melt from the Himalayan plateau. The first two outcomes will immediately have negative effects on Indian society as agricultural crop yields drop in the face of a population increase and rising birth rates. The third effect (Himalayan glacial melt) will initially cause some relief in the form of greater amounts of irrigation water especially along the Ghanges river and its delta region. Over the longer term, however, the amount of melt water available to India will decrease, especially as an increased population requires more drinking water, causing aggregate agricultural output to further diminish. An additional demand for arable land comes from the national priority to develop advanced bio-fuel production capacity to reduce reliance on foreign oil and lower greenhouse gas emissions associated with the transportation sector. This combined demand on India’s domestic farmlands brought forth by increased agricultural and bio-fuel requirements is quickly overwhelming a country accustomed to providing for its population through domestic means. As India looks outward for solutions it will continue along the same lines as other countries in purchasing land primarily in African nations which offer up large tracts off fertile land for fairly low prices. The nexus of climate change and conflict begins to occur in the deal making and negotiating of these land purchases. At this point, it is important to distinguish between the manner in which conflict may manifest itself as these land deals accelerate. The resultant conflict could develop and scale up in two complementary forms: Oppression and Armed Conflict. The main distinguishing characteristic between these two situations is mainly tied to the level of resistance encountered. In the initial phases, oppression will dominate whereby the local populations will offer almost no resistance to government forces resulting in few casualties to direct armed combat, but possibly some fatalities from starvation or drought. As the level of tension and despair rises, and international support is possibly provided, the locals may decide to offer increased resistance in the form of small scale demonstrations, assaults on small groups, strikes or sabotage. As the government perceives increased threats to its authority the chances of direct combat then becomes more likely and casualties could increase substantially. Initially, the level of strategic interest would be fairly low as long as any conflicts were able to be controlled in a peaceful manner using minimal force. However, if disproportionate force were used causing deaths into the ten's of thousands then world media attention may focus on the conflict in Ethiopia and possible induce strategic level attention, with little if any corrective action expected. The outcome of the dispute would be in favor of government forces. The tendency would be to return to the status quo and instill confidence in the foreign investors so they would maintain injections of foreign direct investment and land purchases. 027, June 1997: Niger, Fulani and Zarma tribes pushed into fights by Desertification? 1. Abate, Groum. 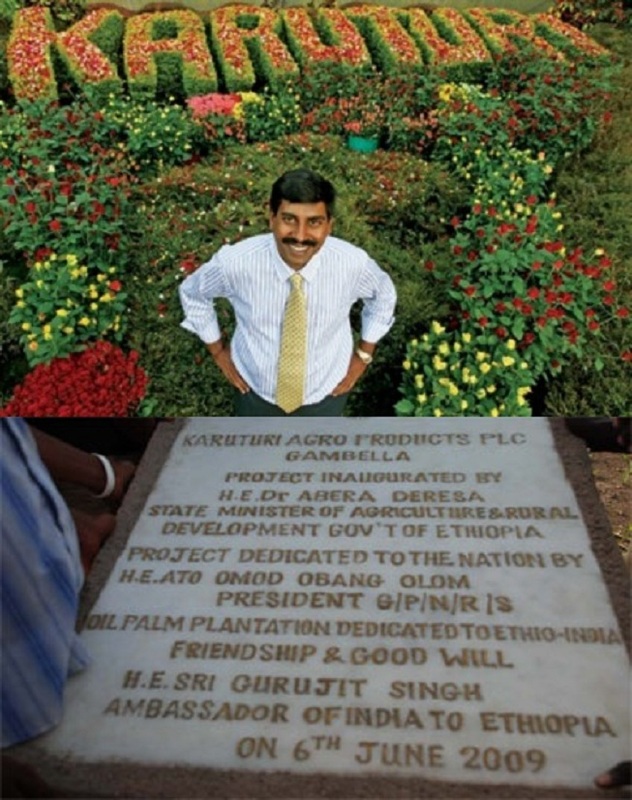 "Indian Company in Ethiopia for Bio-Fuel Production." http://www.prokerala.com/news/articles/a98472.html (accessed 6/20/2011, 2011). 2. Akrik News. "Fear Expressed Over India’s Massive Land Grabs in Gambella." http://www.anyuakmedia.com/Ethionews_10_8_26.html (accessed 6/22/2011, 2011). 3. Anonymous. "AllAfrica.Com: Africa: Investment in Land Opens New Chapter in the Colonisation of the Continent." http://allafrica.com/stories/201106080580.html (accessed 6/21/2011, 2011). 4. Anonymous. "Poverty and Environmental Hazards - the Natural and Human-made Disaster of Famine - Food, Ethiopia, Million, People, Aid, and Relief." Net Industries. http://www.libraryindex.com/pages/2695/Poverty-Environmental-Hazards-NATURAL-HUMAN-MADE-DISASTER-FAMINE.html (accessed 6/21/2011, 2011). 5. Bhatia, Juhie. "Ethiopia: Are “Land Grab” Deals a Path to Food Security? Global Voices." http://globalvoicesonline.org/2011/05/18/ethiopia-are-land-grab-deals-a-path-to-food-security/ (accessed 6/10/2011, 2011). 6. Bose, Sahana. "Role of Indian Sunderban Mangroves in Mitigating Climate Impacts." New Delhi, Jawaharlal Nehru University, 2009. 7. Davison, William. 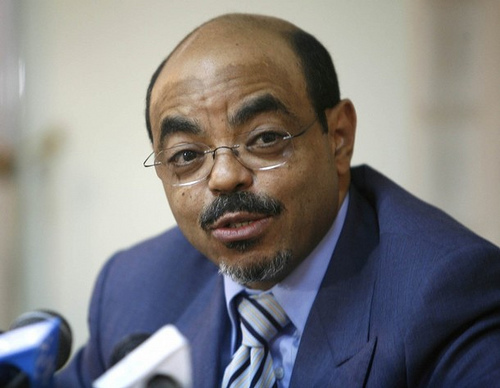 "India Investment in Ethiopia may Double to $10 Billion by 2015, Meles Says - Bloomberg." Bloomberg. 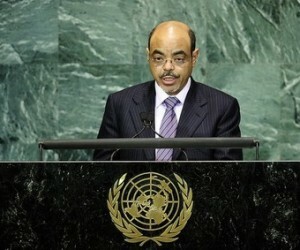 http://www.bloomberg.com/news/2011-05-25/india-investment-in-ethiopia-may-double-to-10-billion-by-2015-meles-says.html (accessed 6/12/2011, 2011). 8. Deininger, Klaus and Derek Byerlee. Rising Global Interest in Farmland: Can it Yield Sustainable and Equitable Benefits?,World Bank, 2011. 9. Dyer, Gwynne. "African Land Grab." http://yaleglobal.yale.edu/content/african-land (accessed 6/15/2011, 2011). Ecadforum. "Land Grab in Ethiopia Continue " ECADF Ethiopian News (Wed, 01 Jun, 2011). 10. Fofack, Hippolyte. "There is no Sovereignty without Food Security." African Business Journal, no. 359 (2009): 22-24. 11. Kugelman, Michael and Susan L. Levenstein. Land Grab: The Race for the Worlds Farmland. Washington, DC: Woodrow Wilson International Center for Scholars, 2009. 12. Macdonald, Nancy. What’s the New Global Source for Fresh, Shiny Produce?. http://www2.macleans.ca/2010/08/19/out-of-africa/2/ ed.Macleans, 2011. 13. Mersha, Genet. "Food Crisis and the Global Land Grab | International Agricultural Land Deals Award Ethiopian Virgin Lands to Foreign Companies." http://farmlandgrab.org/6843 (accessed 6/14/2011, 2011). 14. Ochalla, Nyikaw. "GRAIN | Seedling | 2010 | Land Grabs Threaten Anuak." http://www.grain.org/seedling/?id=680 (accessed 6/11/2011, 2011). 15. Renton, Alex. "India's Hidden Climate Change Catastrophe - Climate Change, Environment - the Independent." 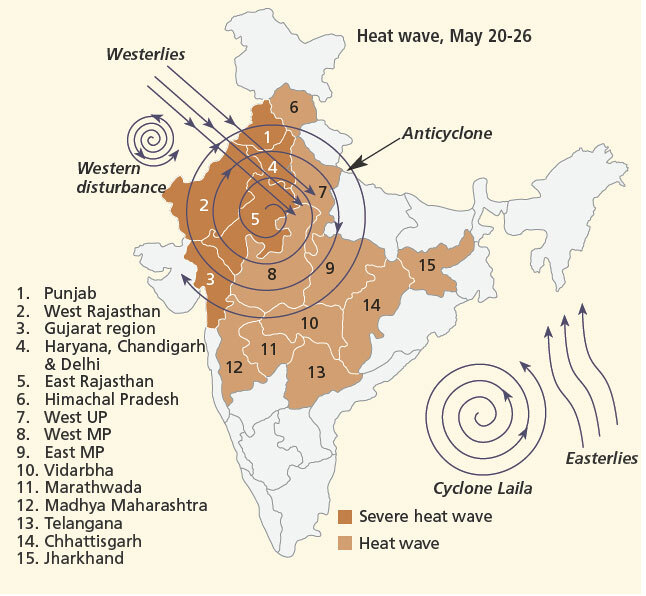 http://www.independent.co.uk/environment/climate-change/indias-hidden-climate-change-catastrophe-2173995.html (accessed 6/12/2011, 2011). 16. Thurston, Alex. "African Agriculture." African Agriculture (Sun, 19 Jun, 2011). 17. 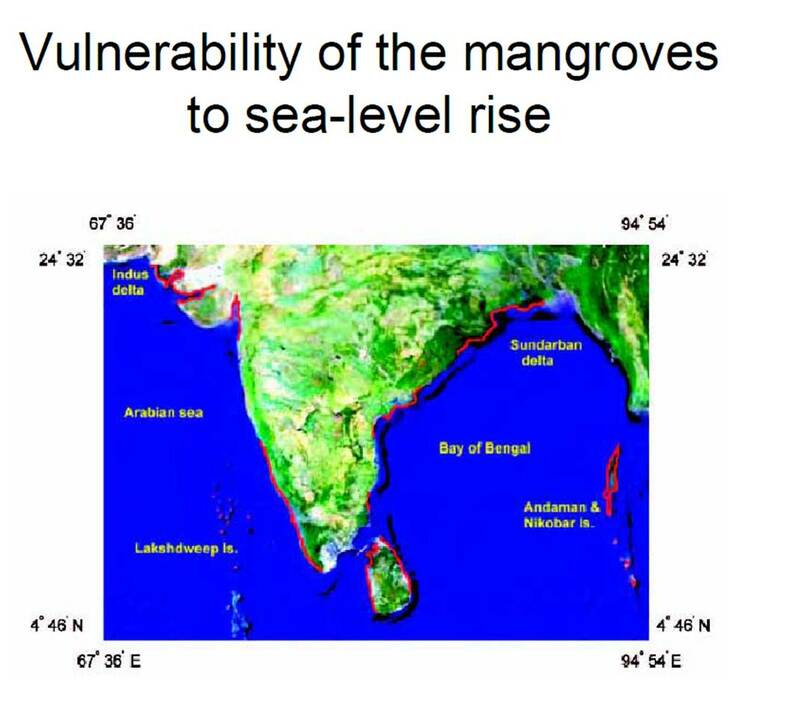 Unnikrishnan, A. S. Sea-Level Changes Along the Indian Coast - Impact and Vulnerability. India: National Institute of Oceanography, Goa, 2010.